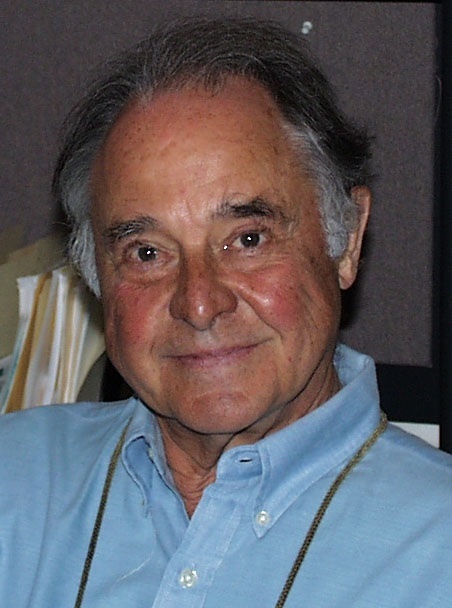 In 1960 the composer, musician, percussionist and mathematician, John Chowning taught computer-sound synthesis and composition at Stanford University’s Department of Music and developed a version of Max Mathews MUSIC audio programming language, MUSIC II for the PDP8 computer. During this period he began experimenting with high frequency modulation of a sine tone and discovered that by using audio-rate modulation (rather than a lower frequency control-rate LFO type modulation) he could create new tones rich in harmonics. In 1973 Chowning published his research in a paper ‘The Synthesis of Complex Audio Spectra by Means of Frequency Modulation’ which eventually lead to the creation of a new approach to audio synthesis known as ‘Frequency Modulation Synthesis’ or FM Synthesis and to the development of the world’s best selling synthesiser; yamaha’s DX range ( Stanford university is rumoured to have collected more than $20 million in license fees and enabling it rebuild the Computer Research in Music and Acoustics (CCRMA) department). In 1971 Max Mathews suggested to Chowning that he create a library of recognisable sounds exploiting FM Synthesis’ ability to emulate harmonic rich timbres – brass, percussion, strings and so-on – and to use Stanford University to approach companies for him. 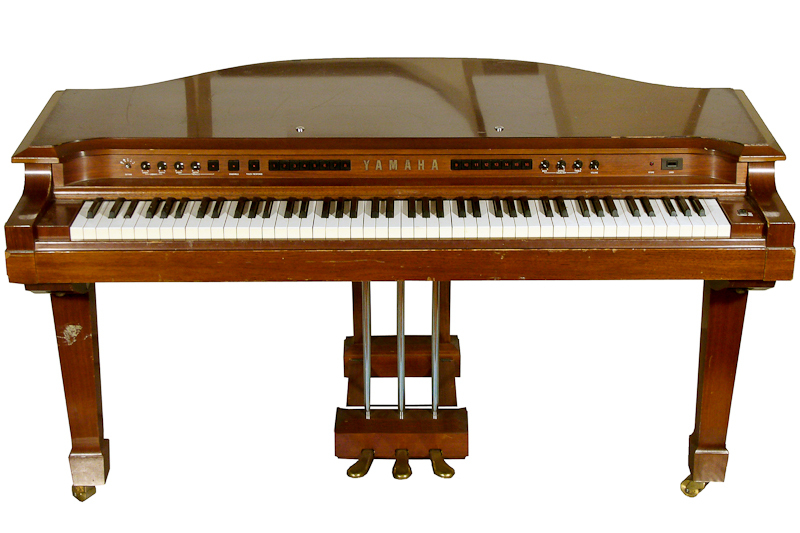 After being turned down by several US based companies such as Wurlitzer and Hammond, Chowning and Stanford approached, somewhat desperately, Yamaha in Japan. Yamaha were looking for a new type of electronic instrument having failed to capitalise on the success of the CS80 and GX1 Synthesisers. Yamaha’s Organ Division bought a license for one year; enough to investigate the commercial potential of FM synthesis. The first application of Chownings FM algorithm was in 1975; a monophonic prototype digital synthesiser called MAD. 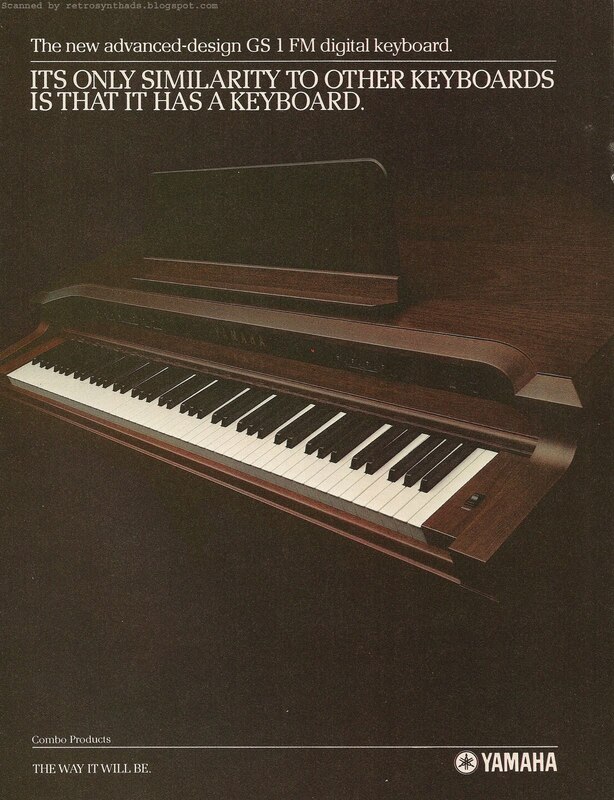 This was soon followed by a polyphonic FM synthesiser prototype released as a production model in 1981 as the Yamaha GS1. The GS1 was an expensive (around £12,000 in 1981) FM synthesiser (but not the first FM synthesiser, this was the even more expensive New England Digital Synclavier released in 1978). The arrival of FM synthesis was greeted with confusion and horror by electronic musicians who had just become used to subtractive modular analogue systems. FM synthesis is a radically different approach to sound synthesis; subtractive starts with a complex waveform and subtracts harmonics and tone with filters and modulation to produce the desired timbre whereas Additive Synthesis has no filters but creates varying timbres through the application of combinations of modulators or ‘operators’. The GS1 had eight operators arranged as four modulators per voice (two on the GS2 model) – which was a very basic implementation of FM. Despite this, the sound quality of the instrument was very impressive, and, despite the perceived complexity of programming FM (alleviated by yamaha supplying a bank of 500 preset sounds on a data stick) the GS1 found favour amongst the large recording studios who could afford them (only around 100 units were sold). 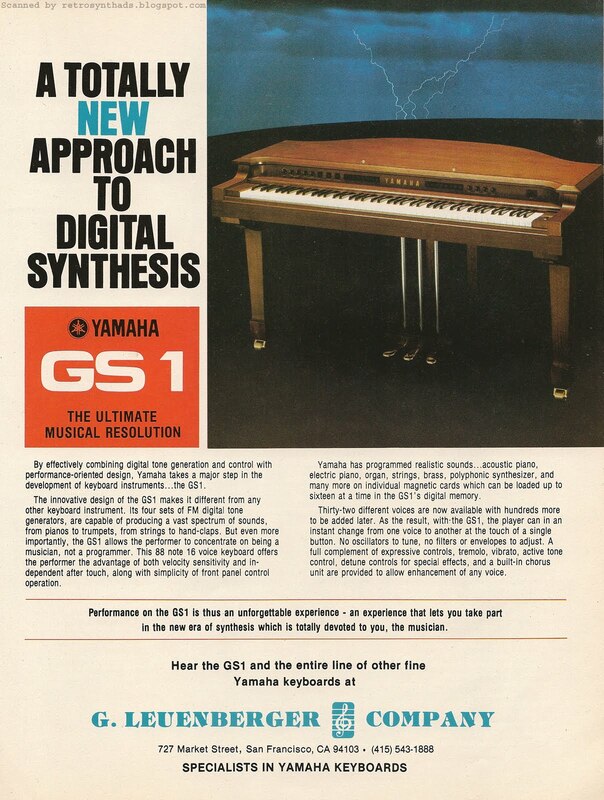 The GS1&2 were superseded in 1982 by the more affordable (£850) mass-market, preset CE20 and CE25 FM keyboards and then a year later in 1983 by the legendary DX7 FM synthesiser. Chowning was born in Salem, New Jersey in 1934. Following military service and four years at Wittenberg University, he studied composition in Paris with Nadia Boulanger. He received the doctorate in composition (DMA) from Stanford University in 1966, where he studied with Leland Smith. In 1964, with the help of Max Mathews of Bell Telephone Laboratories and David Poole of Stanford University, he set up a computer music program using the computer system of Stanford’s Artificial Intelligence Laboratory. Beginning the same year he began the research that led to the first generalized surround sound localization algorithm. Chowning discovered the frequency modulation synthesis (FM) algorithm in 1967. This breakthrough in the synthesis of timbres allowed a very simple yet elegant way of creating and controlling time-varying spectra. Inspired by the perceptual research of Jean-Claude Risset, he worked toward turning this discovery into a system of musical importance, using it extensively in his compositions. In 1973 Stanford University licensed the FM synthesis patent to Yamaha in Japan, leading to the most successful synthesis engine in the history of electronic musical instruments. Chowning was elected to the American Academy of Arts and Sciences in 1988. He was awarded the Honorary Doctor of Music by Wittenberg University in 1990. The French Ministre de la Culture awarded him the Diplôme d’Officier dans l’Ordre des Arts et Lettres in 1995 and he was awarded the Doctorat Honoris Causa in 2002 by the Université de la Méditerranée and in 2010 by Queen’s University, Belfast. He taught computer-sound synthesis and composition at Stanford University’s Department of Music. In 1974, with John Grey, James (Andy) Moorer, Loren Rush and Leland Smith, he founded the Center for Computer Research in Music and Acoustics (CCRMA), which remains one of the leading centers for computer music and related research.